Welcome to The Rainforest Diner, a newly constructed family dining experience at Lincolnshire Wildlife Park. This development has opened the doors to many possibilities for our visitors; space, versatility, functions, relaxation and plenty of food & drinks to try! 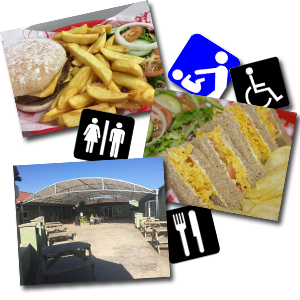 The Rainforest Diner was constructed due to the popularity of our park, with growing numbers of visitors wanting to see and feed our animals and parrots, we had to make some changes to be able to cater for everyone. Offering a relaxing environment for adults as well as a themed room to entertain and captivate young children. Situated next to our outdoor play-frame, its a perfect place to grab some food or a drink and have some time out while the children play. Sit back and relax in our Rainforest themed environment, watch the interesting reptiles and amphibians in our displays or enjoy our patio seating area in the warmer weather. Our menu is loaded with hot & cold food to suit all tastes; with a selection of drinks to accompany your choice. We have children’s meals and vegetarian options as well as snacks and cakes for those who wish to have a bit of indulgence. We invite group bookings into our Rainforest Diner & suggest that you ring prior to your visit date, to ensure we reserve tables for you and to collect a pre-order of food for your group. This allows us to be prepared and for you to have a more enjoyable experience with us. If you would like a copy of our full menu, please use our ‘Contact Us‘ page and we would be happy to email one to you. Attached to the Diner is the ‘Zoovenir’ gift shop which has hundreds of gifts & memento’s to take home. With gifts from as little as £1.00, your sure to find something to remember your special visit or a wonderful gift for a loved one. Please note: We cannot cater for Adult Birthday parties at the moment unfortunately, only Children’s parties, the details of which can be found on our Events page. However we are more than happy to reserve tables in our Rainforest Diner for you to decorate and pre-order meals from our menu (excluding school and bank holidays). Groups of 10 or more also get a 10% discount on your entrance fee. To pre-book a group visit, you can call our friendly team on 0871 384 1130 and select option 3 for reception.